The first Europeans crossed the Alps to the Upper Murray side in 1837. They were pastoralists looking for feed for their cattle in a severe drought. Some of the early squatters names included Shelly, Guise, Watson, McIllree, Hervey, and Cowper. The first three Settlers started arriving in 1866 – Hugh Harris, James Briggs, and Robert Kiell. Other early names to follow were Mitchell, Wheeler, Whitehead, Hanson, Waters, Scammell, Sheather, Evans, Mildren, Pierce, Norrie, Urquarts, Land, McKenzie, Bailey, Jarvis and Carkeek. The late Tom Mitchell (grandson of Thomas Mitchell who came here from Tangambalanga in the early years), was a local ski champion, a former Changi POW, an outstanding orator, elected member for Benambra in 1947 and a Victorian Attorney-General 1950-1952. Tom had a host of interesting pursuits and loved to knit in parliament. He was also instrumental to the development of the Museum. Tom’s wife was Elyne Mitchell, daughter of Sir Harry Chauvel and author of the famous children’s book The Silver Brumby, plus another 24 titles of both fiction and non-fiction. The Silver Brumby tells of the adventures of the magnificent silver colt Thowra, son of the mighty Yarraman and destined to become king of all the wild horses. A noble colt, intelligent and courageous, Thowra, his brothers Storm and Arrow and their friends the bush animals including Benni, the wise kangaroo, are the enemies of the Mountain Men who want to capture the wild horses and take away their freedom. The Upper Murray remains a place of artistic inspiration and natural beauty; it is home to the spirit of the Man from Snowy River located at the pure end of the Murray River. 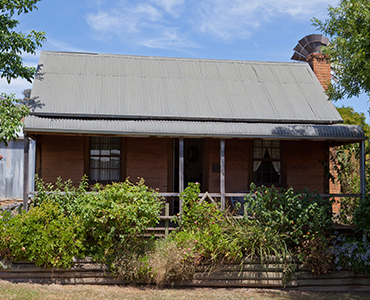 The Jarvis Family were anther early pioneering family and in the 1980s the old Jarvis Homestead was donated to the museum, disassembled and the main building reassembled in the grounds of the Man from Snowy River Museum. 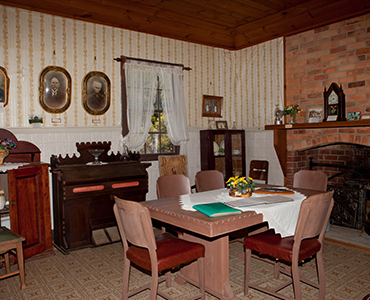 Visitors are welcome to wander through the 2 room cottage and imagine a family of 8 people living there! 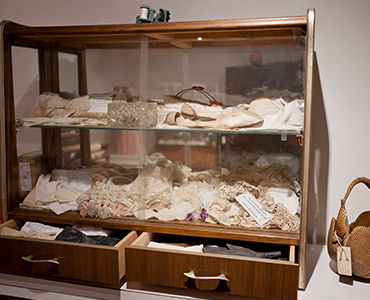 Discover the many unique household items that provided early settlers with the comforts of home. The trusted boiling Billy has many tales to share, the old gramophones still play a note of old, the blacksmith workshop can still shoe a horse and the birthing chair can still bring new life to the world. 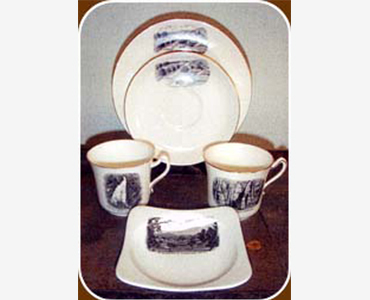 A collection of China side plates, cups and saucers and an ashtray made by Lotus &amp; Moran in England depicts pictures of Corryong — Cudgewa Falls, Corryong, Hansen Street, Corryong, and A glimpse of Corryong West. A framed silk, satin and brocade Tumbling Blocks quilt made by Miss Harriet Dixie in Wales in the early 19th century is on display at the museum. When she died in 1856 the quilt was sent to her son who migrated to Australia and settled in Corryong. 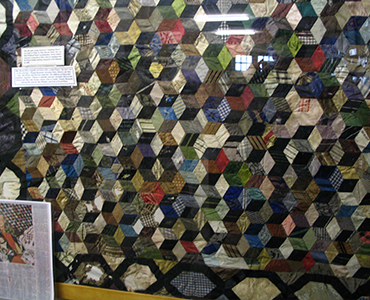 The quilt was passed down through the generations before being donated to the Museum in 1980. 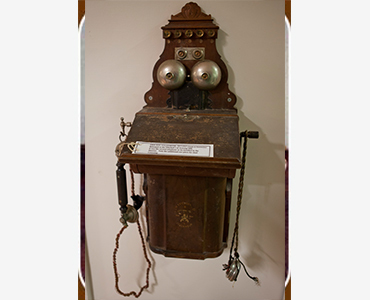 Life was tough in those early years however the early pioneers made do and used their creative talents to entertain and live a simple life that many would envy today.